A New York Times, Wall Street Journal, Washington Post and Businessweek Bestseller. The future belongs to a different kind of person with a different kind of mind: artists, inventors, storytellers-creative and holistic “right-brain” thinkers whose abilities mark the fault line between who gets ahead and who doesn’t. Drawing on research from around the world, Pink (author of To Sell Is Human: The Surprising Truth About Motivating Others) outlines the six fundamentally human abilities that are absolute essentials for professional success and personal fulfillment–and reveals how to master them. 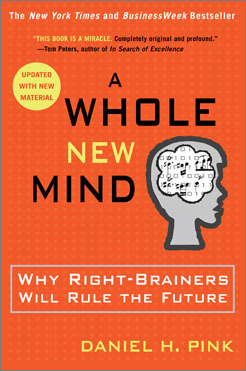 A Whole New Mind takes readers to a daring new place, and a provocative and necessary new way of thinking about a future that’s already here.